Holds Netbooks Up to 11.3 x 8.1 x 1.6"
The black 1075CC HardBack Case from Pelican is a life-saver when it comes to transporting your netbook up to 11.3 x 8.1 x 1.6" (28.7 x 20.6 x 4.1 cm). There are always those heart-stopping moments when the worst happens and you drop the case. In those moments you want a case that will protect the contents. 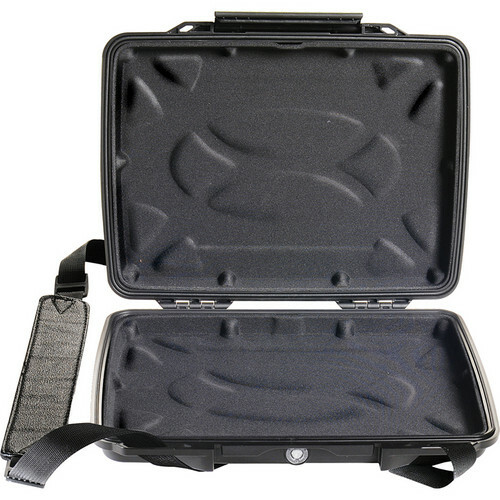 To that end, this case is well-named since it is constructed of heavy-duty ABS plastic that protect it from impact and submersion up to 3' (0.9 m). The shock absorbing, foam insert liner is designed to guard your computer from impact as well as being equipment-friendly since it won't mar the surface of the computer. There's a durable latch system that won't open upon impact as well as a purge valve that prevents water and other contaminants from seeping in. The valve also stabilizes the internal pressure under which your iPad is stored. The handy and removable shoulder strap makes toting this case around easier. When it comes to peace of mind when transporting and storing your gear, Pelican delivers with its made in the USA lifetime warranty. Their name has been synonymous with high-quality for decades and is renowned by pros and amateurs alike who want maximum protection for their valuable equipment. Box Dimensions (LxWxH) 13.5 x 9.9 x 2.3"
1075CC HardBack Case (Black) is rated 4.0 out of 5 by 1. Rated 4 out of 5 by palga from Not for the Macbook Air 11 Nice case, rugged and compact, the strap seems a little on the cheap side but the case is small and lightweight so it probably wont be a problem (except that it doesn't look stylish). The opening hatch is easy and reliable. In case you wonder, it wont fit the Macbook Air 11 (or more specifically 11,6), however if youre in a hurry like I was, checked the pelican website for case fittings, found that its the 1070CC, search the B&H site for pelican 1070, the results of that search actually reads 1075s. Or just read, not like me who just ordered the case not realizing I ordered the wrong case. Eh, well the case fits iPads (wouldt be my first choice for the iPad tough), at least two at the time with room to spare. Still, its a great case if you find the correct size.